Need to get rid of Carpet Beetles? The varied carpet beetle is a 3mm-long beetle. 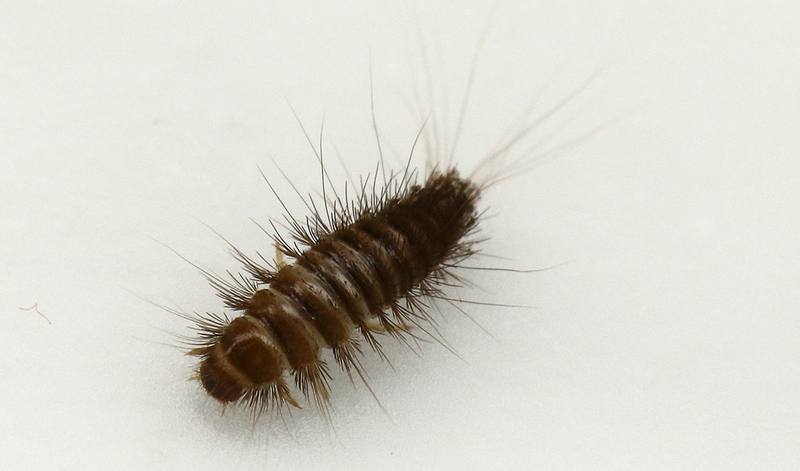 The beetle larvae form is common in houses where they generally do little of no harm, however, larvae can feed on natural fibers and damage carpets, furniture, clothing and insect collections. They are attracted to the protein in natural fibers. These beetles are common in gardens in the summer, thus it makes it hard to eliminate them from homes. Regular vacuuming will help to keep their numbers down. The larvae are about 4-5 millimeters in length & cream colored. They are elongate and very hairy. Their bodies are covered with alternating dark and light brown stripes. The body is usually wider in the back than the front. The adult carpet beetle is multi-colored white, yellow, gray, brown and black. Most carpet beetles can fly, thus making it easy for them to enter your home though open windows, loose-fitting screens, and small cracks & crevices. They can also become a problem if animals are nesting in your attic or crawl space feeding off hair, fur, and feathers. If you have an issue with carpet beetles and want additional information, please call our office for prevention and treatment options.